Britain had a historic Olympic Games. The island nation, with a population of just 65 million, beat China, a country of 1.3 billion, to take second place at the Rio Olympics—both behind the US. Team GB left Rio and lands back in London today with its best medal haul in 108 years—27 gold medals, 23 silvers, and 17 bronzes (a total of 67). 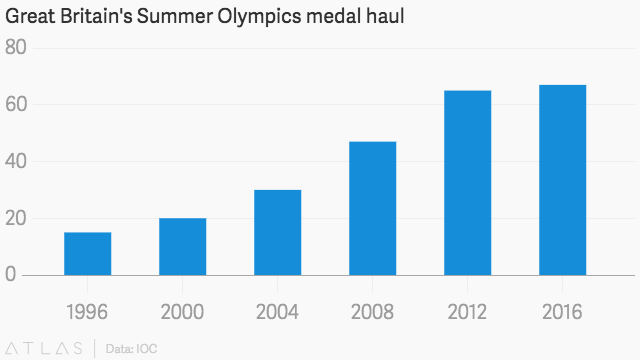 The haul eclipsed the record-breaking 65 medals won on home soil during the London’s 2012 Games. While Britain exploited the so-called home advantage during the London 2012 Games, the host nation went on to do something no other nation has ever been able to accomplish—win more medals at the subsequent Games than at home. When factoring in population, Britain is clearly punching above it weight. Britain comes in at number 13 when ranking gold medals per capita, while the US and China languish in 30th and 54th, respectively. When adjusting the medals-per-capita table to set a base population of 50 million or more, Britain tops the table. The US, Russia, and Japan also make the top ten. No wonder Liz Nicholl, chief executive of UK Sport, the body responsible for promoting sports in the UK, declared on the final day in Rio that Britain is now a “sporting superpower.” It’s even more incredible when you think that Britain 20 years ago languished in 36th in the Atlanta Olympics medal table. So how did the UK turn its situation around? It mostly comes down to money. The most pivotal change took place in 1994, with the creation of the National Lottery and the decision to allocate public funds to elite Olympic sport. The amount spent jumped from £5 million ($6.5 million) a year before the 1996 Atlanta Games to £350 million by Rio 2016. The cost to the British taxpayer? Around £1.09 per person per year. Before 2012, when Adam Peaty was given a travel grant and elite coaching, his family had to rely on family and friends to find the money to fund his training. Two weeks ago, he became the first British male to win a swimming gold in 28 years. Another example is cycling, one of the highest-funded Olympic sports in Britain, getting around £30.2 million. By the end of the Games, every member of Britain’s 14-strong Olympic track cycling team has won at least one medal. Those British Olympic athletes returning to the UK are set for a heroes’ welcome. They flew on a customized airplane with “victoRIOus” written on the side.